Newsletter : news, events for international students in the uk. Welcome to the UK Student Life newsletter. It is updated regularly, so please bookmark this page and keep checking it! The new rules for student visas were published on Monday 9 March 2009. From 25 November 2008, non-EEA students and their dependents who want to extend their visas in the UK will need to provide biometrics (face picture and scan of their ten fingerprints) for an identity card. They will need to make an appointment at one of the identity card centres in Croydon, Cardiff, Glasgow, Northern Ireland, Sheffield, Solihull or Liverpool. The Home Office is introducing new rules for international students coming to the UK. The proposals for the new points-based system for student visa applications were published in July 2008. The implementation plan for the new points-based system for student visa applications (Tier 4) was published on 30 October 2008. The focus of the investigation was on fake degrees issued by Irish International University (which is neither Irish nor a university). A tour company called Astral Tours (providing trips out of London) has ceased operations in the last week of October 2007. Note that before booking a tour which includes an overnight stay it is worth checking to see if it is a member of the Travel Trust Association (http://www.traveltrust.co.uk) - if it is, it should mean that you will get your money returned if the company goes bankrupt after you have paid. If you have a UK credit card it may be wise to use this (not a debit card, non-UK credit card or cash) when you pay for something expensive, as you may be able to make a claim from your card company if the company goes bankrupt. Always be careful when making large advance payments to a private company. It is likely that some other travel companies may go bankrupt, because recent problems in the credit markets have made banks become more careful with companies who owe money to them. Some language schools may also close suddenly, because the Home Office are taking stronger action against schools which allow students who do not attend classes, or against schools who do not provide a proper educational service (generally these are some of the schools offering very cheap classes, eg £500 for a year). New forms are being introduced on 29 October 2007 for visa applications (for people who are applying while outside the UK). The new forms are VAF1 - VAF8. Those applying for a student visa will need to complete the form VAF3. The old forms will not be accepted after 9 November 2007. As well as overall rankings for each university there are also ranking for each of the main subject areas. Ranking tables should always be used with caution. Exact positions are not so important and depend on the chosen methodology. You may be able to obtain some useful information by looking at the scores for the various factors used to calculate the rankings. Planning to travel around Europe by train? Are you a European citizen, or will you have been living in Europe for more than 6 months when you start your travel? If so, then you will want to know that the InterRail Global pass and InterRail One Country pass were introduced on 1 April 2007. These replace the old InterRail and Eurodomino passes. For more information about the new passes and how to buy them, see: Travel/Transport/Train. Student Life in the UK - What's happening in January? January is the middle of winter in Britain. Average daytime maximum temperatures are 7°C, and at night the average minimum temperature is just 0°C. The hours of daylight are short, so people generally spend most of their time indoors and wrap up warmly when they go out. Many people stay up late on the evening of December 31st to celebrate the start of the New Year at midnight. People may meet up with family or friends. Some cities organise fireworks or other celebrations. In Scotland this time is especially important, and the first two days of the year are public holidays (in the rest of the UK only New Year's Day is a public holiday). Christmas decorations are usually taken down on 6th January, which is known as Twelfth Night. Most British schools, universities and colleges start their second of the three terms now, usually known as either the Spring, Easter or Lent term. January is a good time to consider your longer-term work or study plans, especially if you are taking a course which finishes in June. There are also events this month for people who are thinking about taking postgraduate courses. If you are thinking to going to a university to study, find out when it is planning to have an open day. Companies often organise their main student recruitment efforts at this time of the year, both for summer internships and for full-time jobs for graduates. If you are at university you may want to contact the careers centre and to start to prepare your CV or job application forms. Some companies which want to recruit graduates may attend careers fairs in your area. January is also the month when many people start to plan travel in the Easter and summer holidays. If you plan to travel outside the UK or Ireland and you need a visa it is important to make plans many weeks in advance (the visa application process can take a long time). You may want to join an organised tour, or you may prefer to organise your own travel either alone or with friends. One popular way of exploring Europe independently is to buy a train ticket known as an InterRail or a EuroDomino pass. These allow you to travel free on most trains within the zones or countries you choose, although you may have to pay an extra charge on some services. If you plan to buy one of these passes you may need to check the conditions: you need to have been in the UK (or another part of Europe) for 6 months before you start your travel. Student Life in the UK - What's happening in December? December is the start of winter in Britain. Average daytime maximum temperatures are 7°C, and at night the average minimum temperature is just 1°C. It may feel colder if winds come from the north (from the Arctic) or from the east (from Siberia). Snow sometimes falls in December, but usually only on higher ground and in the northern part of the UK (for example in the Highlands of Scotland). The days are shortest at this time of the year: it may not be light until 8am and it will start becoming dark soon after 3pm. Most schools, universities and colleges have a holiday period which includes at least the period between Christmas and the New Year, but on some courses you may have to sit an exam before then. If you are studying English you may be taking one of the Cambridge ESOL exams (for example FCE or CAE). Events this month are dominated by the build-up to Christmas. It is traditional for people to exchange cards with close friends, neighbours or work colleagues. Cards are opened when you receive them, and are displayed at home or in the workplace. If someone gives you a card it is normal to give the person a card in return. Although Christmas is a Christian festival people of all religions (or none) often take part in some of the customs. If you do not wish to send a card which says "Merry Christmas" then you can always choose one with a more general message such as "Season's Greetings". People in the UK usually exchange presents with members of their family. They may place these under a Christmas tree and do not open them until Christmas Day (on December 25th). Sometimes people also give presents to close friends or work colleagues. If you are living with a host family during Christmas it may be a kind gesture to buy presents for members of the family who live with you. Presents do not need to be expensive, but try to find things which you think the person will like and wrap them up in colourful wrapping paper before giving them. Shops are busy in December and often open later than normal. In the weeks before Christmas you may be invited to a Christmas party or meal. If you stay out late try to plan how you will get back home afterwards: on busy nights buses may be full and it may be difficult to find an empty taxi. Be careful, especially if you are a woman and are travelling back home on your own. Take warm clothes with you in case you need to spend a long time waiting outside. If you cannot be with a family or friends over Christmas this can be a lonely time. One idea is to join an organised tour over Christmas, but there are a limited number of places on these tours so you should try to book early. Some international students who have joined the HOST UK scheme spend a couple of days over Christmas visiting a British family. Student Life in the UK - What's happening in November? November is the end of autumn in Britain. The weather is starting to get much colder: average temperatures are 10°C in the afternoon and 3°C at night, so you will need to wear a coat when you are outdoors. Sunset will be at about 4pm so the afternoons will seem very short. Most trees have already lost their leaves. One of the traditional events at this time of year is known as Bonfire Night. In November 1605 there was a plot by a group of Catholics to blow up the Houses of Parliament in order to kill the king and political leaders. The plan was discovered and those involved were killed. To remember this event fires are made in parks and other public places across the UK and the figure of a man is burnt on the top (originally this represented the Pope, but now this usually represents Guy Fawkes, one of the plotters). Fireworks are also set off. In 2006 the most popular date for Bonfire Night events will be on Saturday 4 November, although 5 November is the official date for the celebration. If you are in the UK you may want to check local newspapers and websites for details of what is happening in your area. It is much safer to go to an organised event: remember that fireworks can be dangerous and need to be handled very carefully. Student Life in the UK - What's happening in October? October is the middle of autumn in Britain. Average temperatures this month are about 15°C in the afternoon and 6°C at night, so you will probably need to start wearing a coat to keep warm. On the night of Saturday 28 October you need to put your watches and clocks back by one hour. After this change sunset will be at 4:30pm (compared to 6:30pm at the beginning of October) so the afternoons will start to seem very short. Britain is a very multicultural country. In the period after the end of the Second World War many of the countries which were previously part of the British Empire became independent. For example, some families from East Africa, West Africa and the Caribbean immigrated to the UK. October is African History Month (sometimes known as Black Africa Month), during which there are many special events connected with African history and culture. Many other people came to Britain from the Indian subcontinent (as well as Indians who were forced to leave countries in East Africa where they had settled). This year's Diwali (also known as the "festival of lights") is on 21 October: fireworks are often set off as part of these celebrations. Cambridge is a town in Eastern England. It is easy to make a day-trip here from London: the journey takes about 1 hour by train. Many parts of the town centre are part of the University of Cambridge, one of England's top universities. Visitors need to pay an entrance charge to look inside some of the most popular colleges, which may be closed at some times of the day and during the exam period in May and June. One of the finest buildings is King's College Chapel, which also has a famous choir. Cambridge is a popular tourist destination during the spring and summer months. One popular local tradition both here and in Oxford is punting on the river. Punts are flat wooden boats which you steer with a long pole; if you wish to try punting you can either hire your own boat or you can pay for a chauffeur. There are many interesting museums and shops. Cambridge is compact and the land is very flat in this part of the country, making it an ideal place for walking or cycling. Guided walks are organised by the Tourist Information Centre, and there are sightseeing buses during the tourist season. If you come from overseas to study in the UK, you will want to call your family and friends back home, but you may find the cost of international phone calls is too expensive. There are some ways to cut the cost of calling abroad. You can buy many different brands of cheap international calling cards from newsagents or similar shops, but there are also services which you can buy online (using a credit card) or from your mobile phone (if you have a monthly contract you pay as part of your regular bill, or if you have a pay-as-you-go phone you can use your phone's credit balance). Note that as well as paying for the international part of the call you also need to pay the cost of the call to the access number which you must dial before you enter the international phone number (this is not shown in the costs which are advertised). Calls to access numbers starting with 0800 are usually free if you use a landline. Calls to access numbers starting with 020 or 0845 may be included as part of the "free" minutes you are given as part of a mobile phone contract (this depends on which phone you have and what type of contract you have chosen). Make sure you choose the access number which is best for you. If you and your family have access to the internet, an alternative to the phone is to communicate by computer. Voice internet (VOIP) services such as Skype are cheap. E-mail, instant messenger tools or blogs are also alternative ways of keeping in touch. Before you come to the UK you may want to make sure that your family or friends know how to use these services. Would you like to take part in the annual Great Christmas Pudding Race in London's Covent Garden on Saturday 9 December (from 10am until about 12:30pm)? Teams of six people take part in a series of fun relay races, carrying Christmas puddings and overcoming obstacles along the way. This is the 26th year for this event. If you are a university student, this is a great opportunity to get something different to add to your CV and talk about at future job interviews! New cheaper rates are available for calls to some countries, if you are using the service from a landline which is explained on this website. Student Life in the UK - What's happening in September? September is the start of autumn in Britain. The weather is starting to get cooler: average temperatures this month are about 18°C. Days are quickly getting shorter. This is the month of the autumn equinox, when day and night are each 12 hours (sunrise is at about 7am and sunset at about 7pm). Tourist attractions are less busy, so it can be a pleasant time to travel around the UK. It is the end of the harvest season. There is an old tradition called the "harvest festival" which celebrates this year's crops. Local schools or churches may organise a collection of food donations, which is then offered as a gift to poorer or older members of the community. Because the Queen and the Government are still on holiday, this is the last chance this year to go on a tour of the State Rooms inside Buckingham Palace or inside the chambers of the Houses of Parliament at Westminster. At the seaside town of Blackpool in north-west England special lights are turned on during the evenings between now and early November: this is a tradition since Victorian times and many people go to visit the "Blackpool Illuminations". On the evening of Saturday 9th September there is a famous annual classical music concert called the Last Night of the Proms at the Royal Albert Hall in London. You can watch this on television or you can go to one of the outdoor concerts which is held in parks across the UK at the same time (these are known as the Proms in the Park). September is the time to apply if you want to do a local evening school course, perhaps to follow an interest or hobby or to study a new language. Typically lessons are once a week (during termtime only) and last a couple of hours during termtime. Classes are often taught at local schools. Many British people join these courses after work, so going to an evening school can be a good way to meet local people. You can find out about the courses which are available from your local library or council, or you may be able to buy a courses magazine at a newsagent's. When you come to the UK, try to visit each of the four countries (England, Wales, Scotland and Northern Ireland), as each one has its own particular history and culture. The population of Wales is about 3 million. Its two largest cities are Cardiff and Swansea (both on the south coast). Welsh is the first language in some parts of the country (especially in the north-west), but English is the first language in most parts and is understood by everyone. The country contains some of the UK's finest castles at towns such as Conwy and Caernarfon. The country contains many varied landscapes and is an excellent place for outdoor activities. Some of the most beautiful areas are the hills of the Brecon Beacons (popular for walking and horse riding), the mountains of Snowdonia (popular for climbing) and the coastal areas of Pembrokeshire and the Gower Peninsula (popular for surfing and walking). The central location of Wales makes it quite easy to reach from many parts of England, but away from the coastal areas it is not always easy to get around by public transport as many parts are hilly and not highly populated (joining a tour is a good way to see the more remote places). Wales was once one of the world's largest suppliers of steel, coal and slate, but these have declined and to a large extent have been replaced by newer industries such as tourism and electronics. The end of September is the start of the new academic year at British schools and universities. You may be able to take advantage of "back to school" offers in shops or online, as companies compete by offering deals on books, stationery or other items needed by students. Universities and colleges organise induction courses for new home or overseas students. There may be "fresher fairs" where you can find out about the various clubs and societies which you can join (it is a good idea to get involved in a few, but make sure that you don't join too many so that you have enough time for study). This is a busy time for finding accommodation because many students are looking at the same time (most universities and colleges have some accommodation, but usually not enough to house all of their students). Sometimes students get together with friends to live together in a house or flat, or they may rent a room from a local landlord or family. If you are renting a private room, make sure that you are given a tenancy agreement and ask about any house rules that apply. If there is a gas supply it is a good idea to ask to see the gas safety certificate. You may be asked to pay a deposit of perhaps 1 month's rent - this should be returned to you when you leave unless you have caused some damage or have not paid some of your bills. If anything is damaged or missing when you move in, make sure that your landlord knows this so that you cannot be charged for this (you may want to take photographs which show the original condition of the room). Student Life in the UK - What's happening in August? August is the end of summer in Britain. It is usually one of the hottest months, with average temperatures about 21°C (the hottest days sometimes reach about 30°C, but sometimes the maximum may be only 15°C). This is the main holiday season, so expect travel, accommodation and visitor attractions to be busy. There is a "bank holiday" (a public holiday) in England, Wales and Northern Ireland (but not in Scotland) on Monday 28 August. This is the only such holiday during the summer months, so it is a popular time for outdoor music festivals and for travel. There are music festivals during the bank holiday weekend in Reading, Leeds, London, Cardiff and Liverpool - these are normally very popular so to attend these you normally need to have bought tickets a few months earlier. During this weekend there is also a popular free street festival in London called the Notting Hill Carnival, organised by the local Caribbean community. In Scotland there is a holiday earlier in the month: on Monday 7 August. Edinburgh is the capital city of Scotland, one of the four countries which make up the United Kingdom. Its population is about 500,000. There is a palace here called Holyrood, next to which are the ruins of an abbey. Scottish kings and queens used to live in the palace and move when necessary to the castle, which has been built on an imposing site on the top of a cliff. A road was built linking the palace to the castle: this is known as the Royal Mile. The architecture in the Old Town (a safe walled area where people used to live) is quite different from what was built later outside this area (during the Georgian period, after union with England had been agreed). Edinburgh is an attractive city and contains many museums, shops and visitor attractions. It is particularly busy during the second half of August and at the start of September because this is when it hosts the Edinburgh Festival, an annual celebration of theatre, music and street art. If you plan to visit at this time it is important to book accommodation early. Because it is the capital city, Edinburgh is also the main place from which you can take tours to explore the rest of Scotland. If you have come to the UK to learn English or to find out about British culture it is a good idea to spend some time travelling around the different parts. Many students only go to a few places whose names they have heard, but there are many different intertesting places to explore. If you look at the photos in the Travel/Tours section of the UK Student Life website you can get some ideas about places you can visit. The UK is made up of four countries (England, Wales, Scotland and Northern Ireland) - try to visit all four so that you can understand part of the different culture and history of each one, and so that you can get used to the various regional accents. Student Life in the UK - What's happening in July? July is the middle of summer in Britain. This is usually the hottest month, with average temperatures about 22°C. The school and university years end now both in Britain and in most European countries. Language schools are usually full with European students who are taking short-term English courses during part of their holiday. Tourist attractions are busy: buy tickets in advance if you want to avoid queuing. If you are travelling it is usually wise to pre-book your transport and accommodation. Note that as well as normal types of accommodation such as hostels, bed and breakfast guesthouses or hotels, some universities rent out student rooms during July and August (this can be an affordable option for people who are travelling alone who want basic single rooms). July is another busy month for events. At the start of the month there are the final stages of both the World Cup in Germany and of the Wimbledon tennis tournament (both competitions end on 9 July). There are concerts in many parks, and some rock festivals (including Hyde Park Calling in London, and T in the Park in Scotland). EuroPride is a European gay parade and festival which this year takes place in London on 1 July. The Proms are a series of classical music concerts in the Royal Albert Hall in London: these start on 14 July and continue until mid-September (cheap standing tickets are available for people who queue outside before each concert). There are flower shows at Hampton Park (near London) and at Tatton Park (near Manchester). The Farnborough Air Show is a major aeroplane display in south-east England. Unusual traditions at this time of year include a procession through the streets of Coventry led by Lady Godiva riding "naked" on a horse, and the catching and tagging of swans on the River Thames during the annual Swan Upping ceremony. One of the attractions of studying in the UK is that while you are here you can use the opportunity to see nearby European countries. Paris is one of the most popular places to visit from Britain. It is particularly busy on 14 July, which is a French public holiday: it was on this day in 1790 that a former prison and armoury in Paris called the Bastille was stormed, marking the start of the French Revolution. Paris can be reached in less than 3 hours if you take the Eurostar train, which currently starts from London's Waterloo station. A slower but cheaper way to get to Paris is to take a Eurolines coach from Victoria Coach Station. Joining an organised tour can be easier if you are not confident about arranging your own transport, accommodation and sightseeing or if you simply enjoy travelling together with other people. Check if you need a visa to enter France: if you do, you must apply several weeks before you travel. Remember to take some euros with you, and an adaptor plug if you want to use any of your own electrical equipment. If you plan to make a trip around Europe during the summer, a convenient way to travel around is by train. There are many different types of rail pass available. Some of these (including InterRail and EuroDomino passes) may only be bought by people who have been living in the UK (or other European countries) for the 6 months before the start of the first journey. If you have not been in Europe long enough you can buy a Eurail pass: this is a bit more expensive and doesn't cover as many countries (for example, it doesn't cover travel in the UK - a BritRail pass covers train travel around Britain but can only be bought before arriving in the UK). There are many variations of each type of pass, depending on how many countries you wish to visit and for what period (or on how many days) you want to travel. Cheaper passes are available for people who are under 26. - Updated immigration forms are being introduced, including FLR(S) - the one used for extension of a student visa. The forms which have been changed are: BUS, FLR(M), FLR(O), FLR(S), FLR(SEGS), FLR(FT:WISS), FLR(IED), SET(F), SET(M), SET(O), ELR, NTL and TOC. Make sure you are using the new forms if you make an application (either by post or in person) after 22 June 2006. LTDC (London Training & Development Centre at 14-18 Heddon Street, London W1B 4DA - near Regent Street) was a private school which offered cheap EFL (English as a foreign language) and computing courses for international students. On 20 May it sent its students an anonymous e-mail stating that it was closing suddenly due to "unforeseen circumstances". Students - many of which had paid between £500 and £2,000 for courses of 1 year or more - are unlikely to receive any refund of the fees they paid. The school was on the DfES register, but was not accredited by the British Council or other official organisation. * studying at a recognised institution. - When looking for a course do not just look for the cheapest one. - The fact that a school is on the DfES register does not imply anything about the quality of financial status of a school. It just shows that the school exists and does provide lessons. Do not confuse this with accreditation - if possible, for an English language course try to choose a school which has British Council accreditation, as this means that it has been carefully inspected. - Before paying for a course, check that you know what will happen if the school stops trading. If a school is accredited it is more likely that students will receive money or be offered an alternative course if a school closes. If the school is part of a chain of language schools, check if it owned by this chain or if it is a franchise. If it is a franchise, there is no guarantee that the larger company will help if the school gets into financial trouble. - Consider paying course fees by credit card instead of using cash or a debit card. The reason is that there is some insurance for goods bought by credit card, so it is possible you may be able to get some money back if the service which was bought is not provided. - Look for any bad signs before paying for a course. If a school is having financial problems it may try to get cash quickly and avoid paying its bills. To get cash, it will advertise widely, probably offering very cheap courses, to try to attract new students. Class sizes may be large, and teachers may be poorly qualified. The school may encourage new students to pay course fees by cash. It may start cancelling classes, making excuses such as that the teacher is sick or building work needs to be done - in reality it may be that it has no teacher because it has stopped paying salaries to staff. The building may be poorly maintained. In some cases the school may not care about student attendance, or may even illegally offer documents showing false attendance (if caught doing this, the school will be closed). Check how long a school has existed. Do not assume anything about quality because of the school's name - a bad school sometimes tries to attract students by using a similar name or logo to an established location or brand. - Think about the economics for the school. If it is very cheap then the options are: (1) it rents a cheap building in a non-central location (2) it has very large class sizes (3) it allow students to enrol who don't go to the classes (4) it employs unqualified or poorly qualified teachers (5) it doesn't provide good study facilities (6) it doesn't maintain the building (7) it is about to go bankrupt and is desperate to get cash quickly. Be very cautious about cheap, centrally located schools which are not accredited. The cost of renting buildings in London around Tottenham Court Road / Oxford Street / Regent Street is very high, so if the number of students at a school in one of these locations drops for some reason, the school is quite likely to have financial problems. Have you been affected by the closure of LTDC? If so, please contact us and explain how you have been affected. If you are an international student doing a Masters or PhD course in the UK, the rules about working after your course have changed (since 1 May 2006). SEGS (Science and Engineering Graduates Scheme) enables certain non-EEA students who have successfully completed and obtained a degree (with second class honours or above), Master's degree or PhD to work in the UK for up to 12 months upon completion of their studies. Masters or PhD students taking any subject (not just specific science/engineering courses) will in future be able to apply for SEGS. The rules are quite complex and keep changing, so if you think you might qualify for this you are advised to check with the international students office at your university. Student Life in the UK - What's happening in June? June is early summer in Britain. Average temperatures have risen to about 19°C. At this time of year it doesn't get dark until about 9:30pm. This can be a difficult month if you suffer from hay fever (in particular if you are allergic to grass pollen). Parks and gardens are attractive: roses are now at their best. British strawberries go on sale: it is common to eat these with some cream and sugar, perhaps as part of a picnic. Over the summer months there are often special outdoor concerts (sometimes free), so it is worth finding out the programme of events at local parks or beauty spots. June is a busy month for sporting events. This year there will be a lot of attention on football, because the World Cup tournament starts in Germany on 9 June. England is the only UK team which has reached this final stage (its first games are on 10, 15 and 20 June). Many people will go into pubs to watch these games live. Other popular sporting events include the Derby (a horse race at Epsom on 3 June), the British Grand Prix (motor racing at Silverstone on 11 June), and Wimbledon (two weeks of lawn tennis in south London, starting on 26 June). There are also many royal events in June. The Queen's official birthday is on 17 June, marked by the annual Trooping the Colour ceremony in the grounds of Buckingham Palace. During the following week the Queen attends the horseracing event known as Royal Ascot: on Ladies' Day the fashion worn by the lady spectators attracts more attention than the races! If you are studying at a British university, the exams usually finish by the middle of the month. There may be special parties to celebrate the end of the academic year. Students wait nervously to hear their results and plan their summer holidays or jobs. Graduation ceremonies usually take place a few weeks after the exams. The Isle of Wight is an island off the south coast of England, close to Southampton. It is possible to take a day-trip here from London, using a train or coach to get to the coast and then a ferry. During the crossing you can see many sailing boats. The island has an attractive coastline, including stretches of sandy beaches and impressive chalk cliffs (for the best views take an open-topped bus from Yarmouth to Alum Bay). There are several charming villages and towns to explore, including Shanklin and Godshill. You can also visit the interior and gardens of Osbourne House, which is where Queen Victoria spent many of her holidays. A major outdoor rock festival is staged near Newport from 9-11 June, but tickets for this are usually sold out in February. If you plan to travel in the UK by train, you can save money by being organised. For longer journeys (outside your local rail network area) a limited number of cheap tickets become available about 6 weeks before the day of travel (look for tickets with names such as "advance" or "Apex"). It can be much more expensive if you just buy a ticket from the ticket office on the day of travel. For shorter journeys you can buy tickets on the day of travel but try to avoid starting your journey before 10am on weekdays, as you may be charged a peak-time fare. There is no peak-time fare at weekends or on public holidays, but if you travel then you should check in advance for any engineering works which may delay your journey. If you are a student or are under 26 you can buy a Young Persons Railcard (now called a 16-25 Railcard), which will give you a third off many of the fares. If you plan to travel around Europe by train for a holiday, consider buying a rail pass - you may be able to buy the cheapest types of pass only if you have been in the UK (or another part of Europe) for at least 6 months before the first day of travel. May is springtime. Average temperatures are about 16°C and days are getting much longer: in London the sunrise is at about 5am and sunset at about 9pm. Gardens are full of colour (there is a famous event in London called the Chelsea Flower Show). Now is a good time to get out and enjoy the parks and countryside, and perhaps to take a tour before the busy tourist season begins. There are two public holidays in May: on Monday 1st (May Day) and Monday 29th. Many people take 3-day (long weekend) trips, so the airports and roads may be very busy. May is the month for spring traditions: for many years people have celebrated the end of winter and looked forward to a good summer and harvest. In towns and villages across England and Wales you may be able to see demonstrations of Morris dancing (it has many different regional forms). 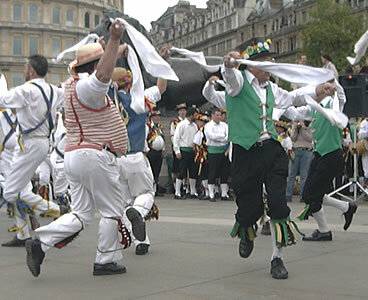 On May Day there are special local festivals, including ones in Oxford, Rochester and Hastings. The sporting highlight of the month in England and Wales are the finals of knockout football competitions: the FA Cup Final and the Scottish FA Cup Final. It is not easy to get tickets for these games: most people watch on television either at home or in a local pub. If you are studying at a British university, the end-of-year exams are usually between mid-May and mid-June. If you visit a university town such as Oxford or Cambridge you will probably not be able to go inside the colleges until the exams have finished. 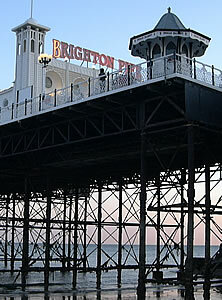 Brighton is a popular seaside town on the south coast of England. It is very convenient to visit there from London: it takes about 1 hour by train or 2 hours by coach. In May there is also a popular 3-week arts festival here, and in August there is a famous Pride parade organised by the local gay community. Brighton's population is quite young: there are many university and college students here during the academic year (from September to June) and during the summer it becomes full of tourists and language school students. There is a stony beach and a pier which extends over the sea, with food stalls (including fish and chips), amusements and a funfair. Brighton is a good place for shopping and nightlife. A popular tourist attractions is the Royal Pavilion, a palace located near the town centre. There is some beautiful scenery in this area, so take a bus out of town and go for a walk in places such as Devil's Dyke, Beachy Head or Seven Sisters. When you are travelling in the UK you will need to find places to stay. The cheapest options (apart from camping) are hostels, where you will usually stay in a shared multi-bedded room. There are two main types: youth hostels (these accept children as well as adults and are often located in the middle of the countryside), and independent hostels (these usually only accept people over 18 years old and are normally in town centres). The next cheapest option is to stay in B&B (bed and breakfast) or guesthouse accommodation: these are small family-owned businesses (ask the local tourist information centre for details). Hotel prices can vary a lot - it can be much cheaper if your accommodation is included as part of a packaged holiday, or there may be last-minute discounts for online bookings if the hotel is not full. Please read the rules at the top before you post any messages. Inappropriate messages will be deleted. - If you are making cheap international calls from a mobile using the service shown on this website (obtaining credit by texting the word pay to the number 83006 or 80550, and then making a call using 020 7124 6666 followed by the international number), note that from Monday 19 December the access charge will be the same as the cost of a 1 minute call (eg: 2p if you are paying 2p per minute). You can print each month's page either portrait or landscape. A competition open to international students in the UK. To enter, students need to write an e-mail which describes how they have made the most of their time in the UK (for example: through involvement in community life, work experience or participation in cultural or sporting activities). The overall winner will receive £2000, and 11 regional winners will each win £1000. 36 other runners-up will receive £25 book/music tokens. The closing date for entries is 20 February 2006. An award ceremony will be held in London on 27 April 2006. From 13 November 2005 if you are from outside the EEA or Switzerland and wish to come to the UK for more than 6 months you will need to obtain entry clearance at a British embassy or High Commission before travelling. Previously this requirement only applied to nationals of some countries. From 1 October the national minimum wage will be £5.05 per hour for adults aged 22 or over (previously it was £4.85), and £4.25 for those aged between 18 and 21 (previously it was £4.10 per hour). For more information, see: Work/Search. From 13 November 2005, all nationals from non EEA member states who wish to come to the UK for more than six months will need to obtain an entry clearance from a British diplomatic mission (for example: the British Embassy or British High Commission) before travelling. From 1 July 2005, the cost of applying for a student visa at a British embassy will rise from £36 to £85. Visitor visas (for stays up to 6 months) will cost £50. For full details, click: here. - For a postal service the current fee is £155. This will increase to £250 for students, and to £335 for others. - For a premium service (personal application) the current fee is £250. This will double to £500. - For people applying under the Highly Skilled Migrant Programme the fee will be £315. - For people applying under the Sectors Based Scheme the fee will be £153. Applicants who are refused leave to remain will no longer be allowed to appeal against the decision. Dates for the listening and speaking parts of the tests are arranged by the local test centres. For more information about the exams, see: English/Exams/Cambridge. IELTS tests are on 48 dates through the year. Test centres decide which dates to have tests, depending on how many candidates they have. You should register for the exam at least 5 weeks in advance. For more information, see: English/Exams/IELTS. The rules for working holidaymakers have been changed so that only 12 months of employment is possible during the 2 year period of a working holiday (these new rules only apply if entry clearance was obtained on or after 8 February 2005). It will be possible for people to apply for work permits after 12 months if they are highly skilled or are working in one of the designated shortage occupations. The Labour party has proposed changes to the immigration rules which may make it more difficult in future for people from outside the EU to work full-time in the UK except in skilled jobs which cannot be filled by British or European workers. A points-based system may be introduced for work permit decisions, attempting to measure the contribution the person will make to Britain. Scores in English language tests will be one of the criteria used to decide if someone is able to stay in the UK. For details, see: http://news.bbc.co.uk/1/hi/uk_politics/4241989.stm and http://news.bbc.co.uk/1/hi/uk_politics/4244707.stm. From January 2005 the Home Office will only give immigration permission (visas, entry clearance and leave to remain) to students if the place of study is on the Register of Education and Training Providers. This list has been created the UK governments Department for Education and Skills (DfES). This Register has not been published yet, but schools should be able to tell you if they are on the register. All other institutions have to apply to be added to the Register and need to be inspected and approved by government inspection bodies. It is very important that you check whether the school/college/university where you want to study is in the Register before you make your immigration application. If it is not in the Register, your application will be refused. You need to be particularly careful about checking this if you are applying to study English at a private language school, or computing at a private computer school, especially those which charge very low fees. Note that the fees for making an application for a student visa extension (currently £155 for postal applications and £250 for personal applications) are not refunded if your application is unsuccessful. From 1 October 2004 the rules for VAT refunds for students are changing. If you are a student from outside the EU, you can claim a VAT refund on goods which are bought in the UK (in shops which offer "tax-free shopping") within the 4 months up to the end of your studies, and you must plan to remain outside the EU for at least 12 months after leaving. For example: if your visa expires during July 2004, you can buy goods under the scheme any time between 1 April 2004 and 31 July 2004, but you must be planning to remain outside the EU until after 31 July 2005. On the claim form you must sign a statement saying this: if you make a false declaration, your goods may be seized or you may have to pay a fine. If you are planning to come back for a holiday or for further studies in the UK or another country in the EU within the following year, you cannot apply for a VAT refund. The rules have been changed because some international students were abusing the VAT refund system. From September 2004, students may not be able to extend their visas beyond 2 years after their date of arrival in the UK if they are studying short courses (1 year or less) below university degree level (for example if studying at a language school). Previously the limit was 4 years. The Public Enquiry office in Croydon is following the Home Office's other public enquiry offices (PEOs) by changing to an "appointments only" system. Instead of going to Croydon directly and joining the queue, you should now telephone 0870 606 7766 to make an appointment. You can now top-up the mobile phone service with either £3 or £5. You pay for credit by texting the word pay to one of two numbers. Note that the number to use for the £3 top-ups has been changed. You are now given a PIN (personal identification number) which you enter when you make a call - this allows you to use the service from any UK phone. Call rates to India and Pakistan have been greatly reduced, but the connection charge has been increased for these locations only. The call charges have been reduced for landline calls to many locations. Check the rates for your country using the drop-down box, and make a note of the number to call. A PDF version of the British Council's book "Studying and living in the United Kingdom 2004/2005" can be downloaded free. Google is developing a new free e-mail service called Gmail. It is not yet available, but when this is released it should allow you to store much more information than Hotmail (Microsoft) or Yahoo: you can keep over 1,000 Mb (Hotmail allows 2 Mb, and Yahoo allows 4 Mb, although you can have up to 100 Mb if you pay). You will also be able to search all of your messages and see all related messages together. For more information, see: http://www.gmail.com. Australia, Canada, Hong Kong, Japan, Malaysia, New Zealand, Singapore, South Africa, South Korea, USA? Since 13 January 2004 entry clearance is required for people from these countries who want to stay in the UK for longer than six months. This means that you can no longer get a student visa at a British port or airport. For further details of immigration rules, including how to extend a student visa, see: Prepare/Visa. If you need to travel to the Home Office building (Lunar House) in Croydon, see: Prepare/Croydon.